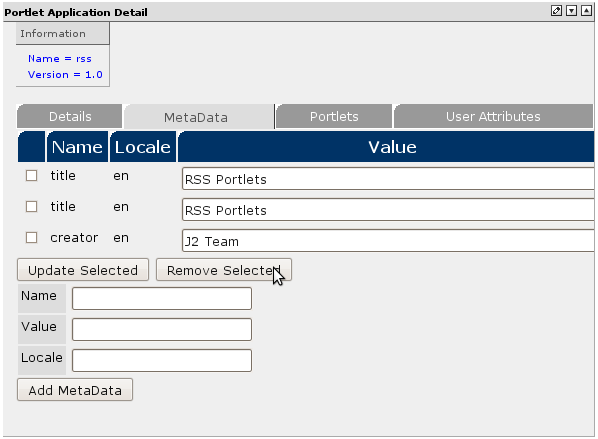 The Portlet Application Manager window defaults to displaying J2_ROOT and it's sub APP_ROOT. Click on the switch icon next to APP_ROOT to display the list of available applications. Each of the applications has a switch icon to display one or more portlets associated with each application. 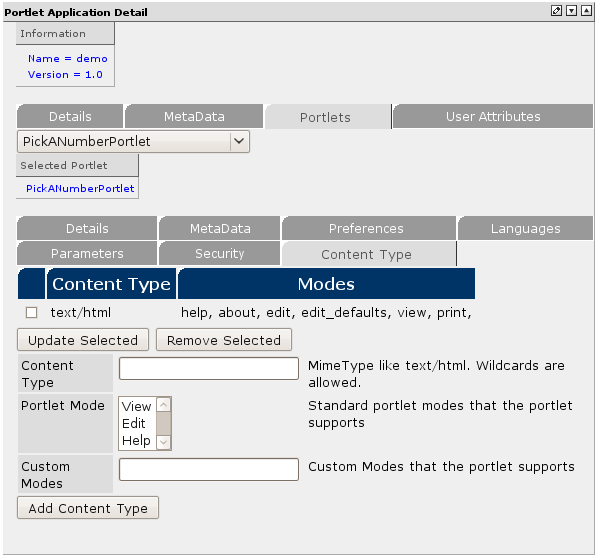 Clicking on any application link will populate the Portlet Application Detail window to the right. 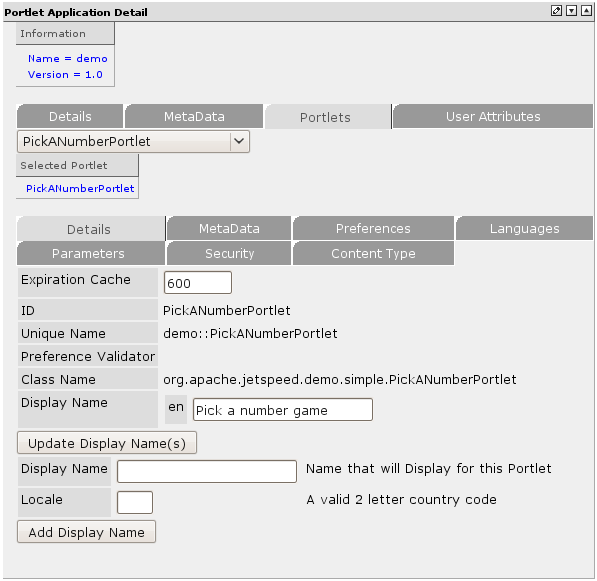 Clicking on any Portlet Link will populate the same window with the application details and the portlet details. Search Search will locate any applications, portlets or keywords that match your search parameter and display them in the search section. 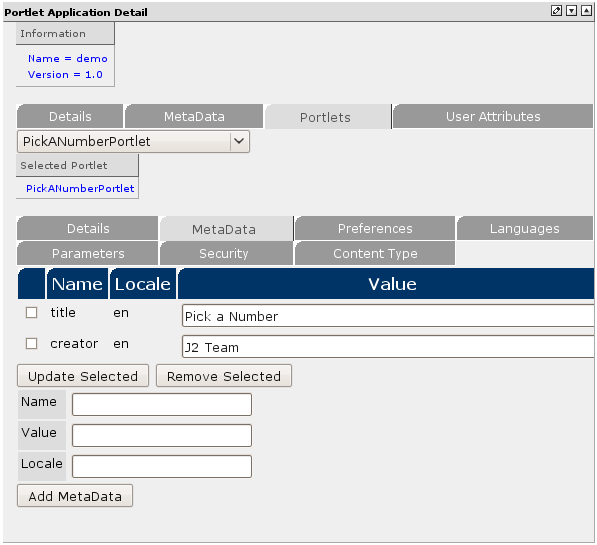 Application Tree View Hierarchical view with clickable link for applications and their associated portlets. Name Name of the application war file. Version Version number of the application. Description Optional field for describing the application. ID Generally the same as the application name. 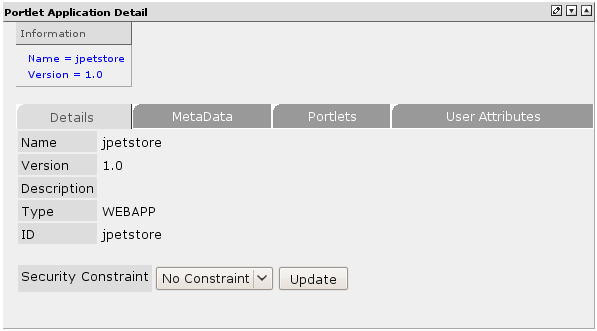 Security Constraint The dropdown menu contains the following options : No Constraints, admin, manager, users, public-view, public-edit, AEUV, dev, devmgr and delegated. 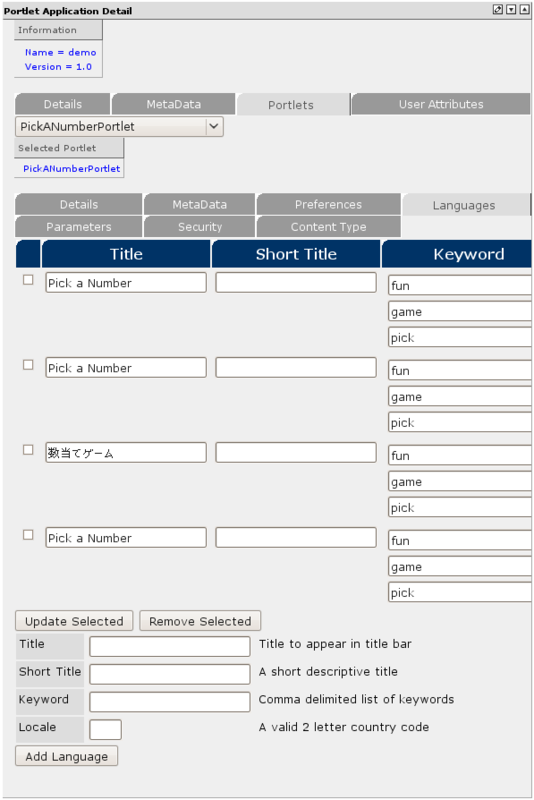 Name Name of the Metadata field. 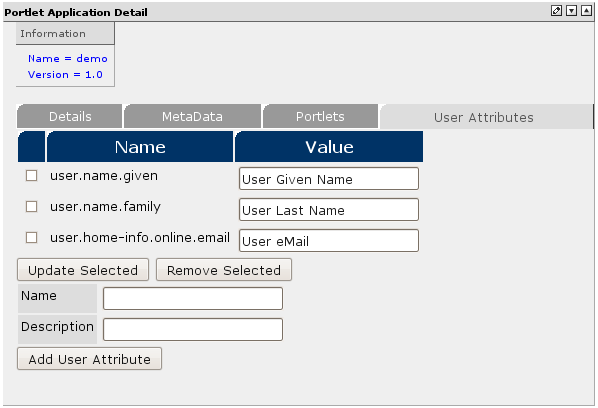 Value The value to associate with the Metadata field name. Locale A valid 2 letter country code. 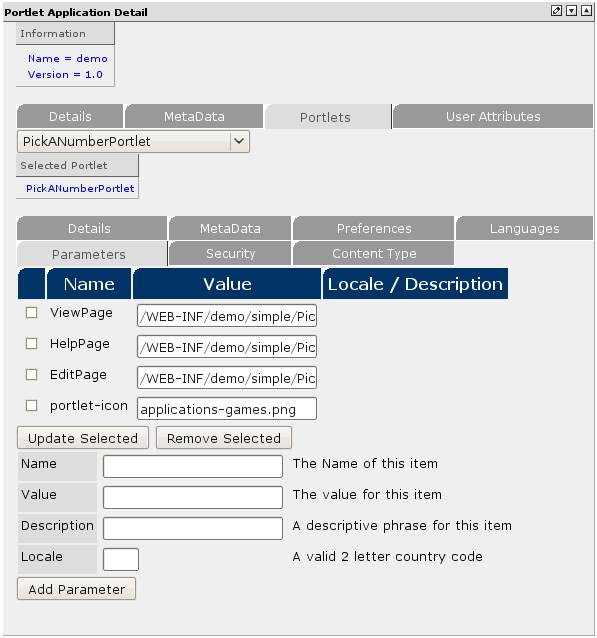 Drop Down Menu A dropdown menu to select any portlets contained within the application you are viewing. Selecting a portlet will refresh the window with portlet details. Value The value of the associated attribute. Expiration Cache A value of -1 sets the Expiration to never expire. 0 to not use Expiration. Any other value will be time for Expiration in seconds. ID The id of the portlet. Unique Name This field is formatted as application::ID. Preferences Validator A class implementing the PreferencesValidator interface can be associated with the preferences definition in the deployment descriptor. Class Name Contains the fully qualified class name of the portlet. Display Name Multiple entries are allowed. A valid 2 letter country code for the Locale and a Name that will display for that Portlet in that Locale can be added in the section below. 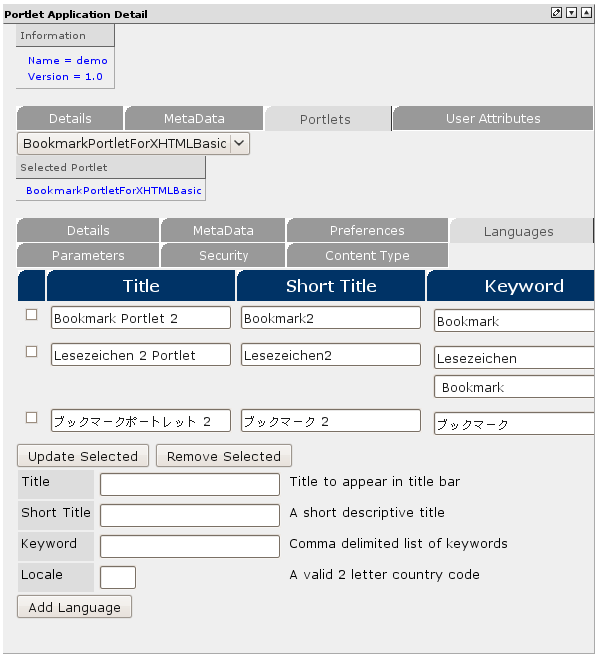 Locale A valid 2 letter country code.The value to associate the Metadata field name. Value A valid 2 letter country code. Name Name of the preference you wish to create. Value The value of the preference to be associate with the preference. Title Title to appear in title bar of the portlet. Short Title A short descriptive title. Keyword Comma delimited list of keywords to associate with the portlet. 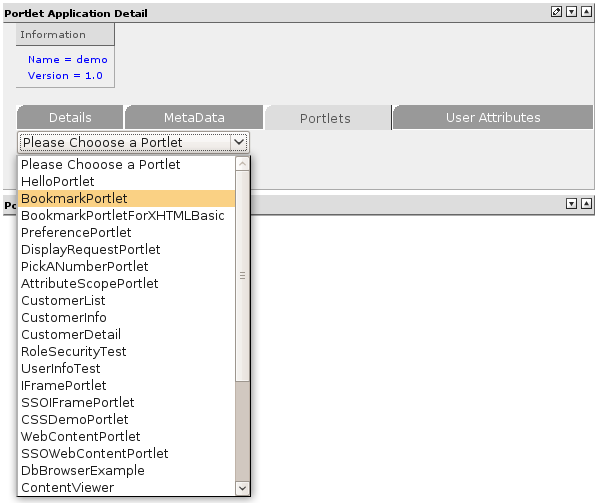 Name Name of Parameters to be associated with the portlet. Value The value to be associated with the Parameter name. Description Optional description of the portlet. Locale Optional valid 2 letter country code. Role Name The name of the role. 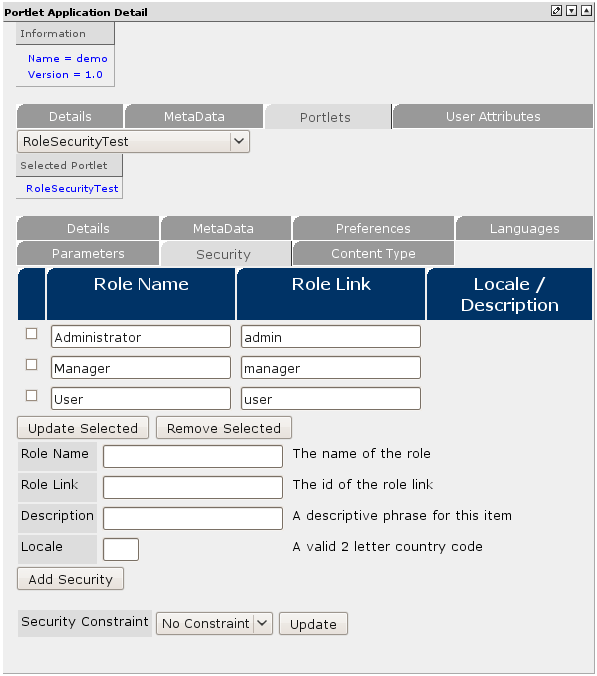 Role Link The id of the role link. Description A descriptive phrase for this item. Content Type MimeType like text/html. Wildcards are allowed. Portlet Mode Standard portlet modes that the portlet supports. Shift-click to select multiple. Custom Modes Custom Modes that the portlet supports. Custom Modes are added directly to the modes list after any Standard Modes.